BC Ferries accounts for nearly 75 percent of large vessel marine traffic on Howe Sound. Several proposed and approved industrial activities, such as an LNG plant, could lead to a marked increase in shipping traffic in the Sound in the coming years. With an increase in potential conflict with boats, recreation, and marine life, it will be important to understand the risks and consequences. Contributors: Members of a discussion table at the Howe Sound Aquatic Forum, June 17, 2016 workshop. Howe Sound is a valued marine transportation corridor, which supports local, regional and global economies. Currently, most of the goods and raw materials moved through Howe Sound are associated with the forest industry. In terms of vessel traffic in and out of Howe Sound, the movement of goods by large vessels is dwarfed by the movement of people (and their vehicles) on BC Ferries. Between 2011 and 2015, large vessel traffic in Howe Sound increased by seven percent. Tug traffic alone increased by 24 percent. In 2015, almost 13,000 large vessels (i.e., vessels over 20 metres in length, including ferries, coastal tugs, cargo vessels, and a few coast guard vessels and fishing boats) entered Howe Sound (Figure 1). Ferries alone account for 72 percent of this traffic, while tugs make up 24 percent. The volume of traffic increased slightly (by seven percent overall) between 2011 and 2015 with most of the increase represented by tug traffic (Figure 1). Averaged over a year, the large vessel traffic volume translates to 35 vessels per day entering Howe Sound. Figure 1. 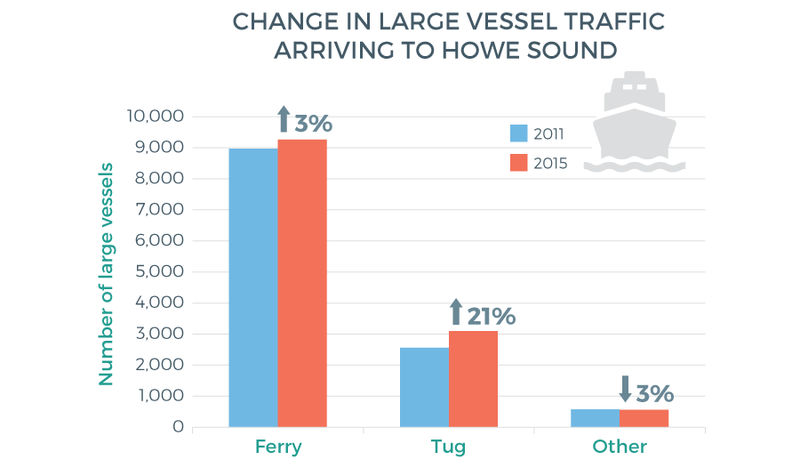 Large vessel traffic arriving to Howe Sound in 2011 compared to 2015, with percent change shown. In the next few years, two coastal development projects, in different stages of planning and permitting, would add to the large vessel traffic in and out of Howe Sound, if they proceed. The Woodfibre LNG project would bring LNG carriers in out of Howe Sound and the Burnco Aggregate project would transport gravel by barge out of the Sound. In addition, the volume of timber arriving by log boom to the Mamquam Blind Channel for processing is projected to increase and several other projects in the conceptual stage may add to marine traffic as well. The maritime industry refers to the business of trading by sea. Over 90 percent of the world’s trade is carried by sea, which is the most cost-effective way to move goods and raw materials around the world, according to the International Maritime Organization. Merchant vessel traffic accounts for only about 25 percent of the large vessel traffic in Howe Sound, because the volume of BC ferry traffic coming and going from Horseshoe Bay overwhelms all else. However, the maritime industry and marine transport is invaluable to the pulp and paper operation in Howe Sound and to the forestry industry extending well beyond Howe Sound and B.C. 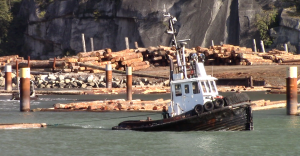 The annual value of logs shipped out of Squamish through the Mamquam Blind Channel Port is about $60 million, while the value of logs arriving from elsewhere on the coast to be handled in Squamish is $40 million. The BC Ferries traffic, which makes up 72 percent of the large vessel traffic, is part of the Province’s highway system and provides crucial transportation links between Horseshoe Bay, Bowen Island and the Sunshine Coast, with a terminal at each location (Figure 2). The remaining large vessel traffic includes Coast Guard and Department of Defence vessels, fishing vessels, the occasional cruise ship on a scenic loop around Bowen Island, tour boats and a few large yachts. Figure 2. Terminals, ports and density of vessels over 20 metres in length, including government vessels, research vessels, passenger and cruise, fishing vessel traffic, tug and service vessel, shipping and transport vessels, in 2010. Facilities at Mamquam Blind Channel (Squamish) and Watts Point are missing from the map. 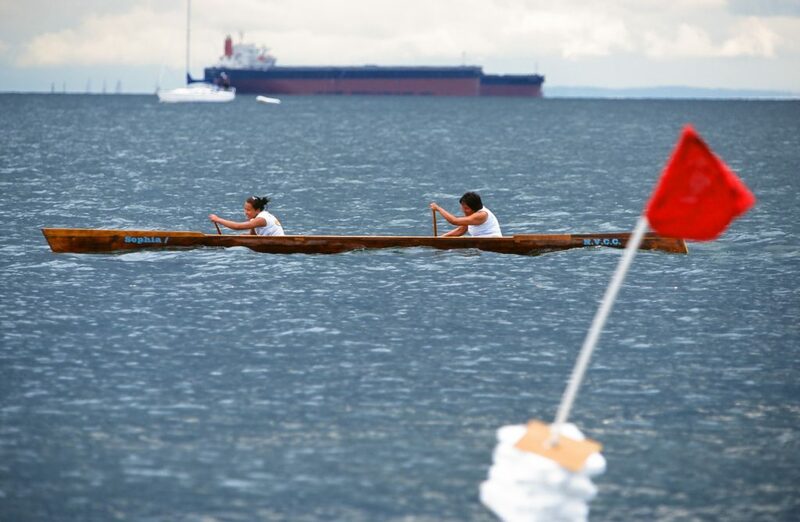 During modern-day ocean-canoe journeys, Squamish canoe paddlers take their songs — representing the natural rhythms of the land in harmony with all of creation — to other First Nations to share in the richness of West Coast traditions. 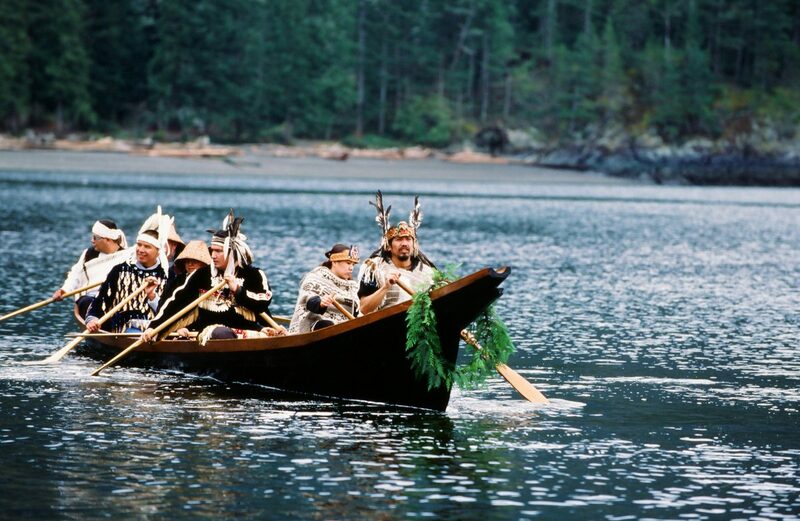 In the long ago, Squamish people were known to travel by canoe to Alaska, Hawaii, California, and South America. Today canoe racing is a popular sport. Vessels over 20 metres in length are tracked by Marine Communications and Traffic Services (MCTS). None of the vessel trips that take place within Howe Sound without leaving Howe Sound (e.g., ferries between Horseshoe Bay and Snug Cove) would be included in the tally of vessels arriving to the Sound. Large vessels moving within Howe Sound are required to have an Automatic Identification System (AIS) transceiver that supplements marine radar and allows large vessels to track each other. The tracking systems allow overall vessel traffic densities to be calculated. Densities, mapped by the BCMCA using MCTS data from 2010, are highest in Queen Charlotte Channel between Horseshoe Bay and Bowen Island as a result of all the ferry traffic in and out of Horseshoe Bay. 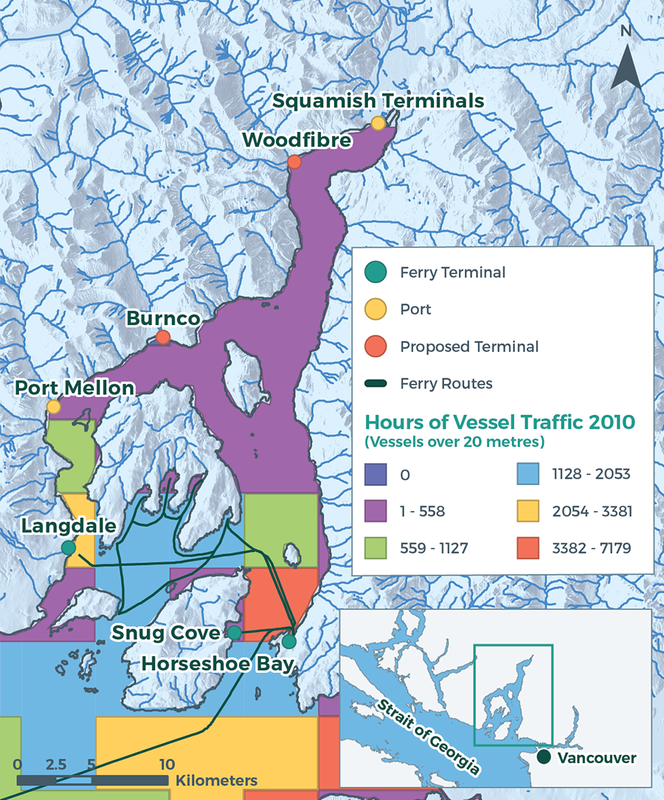 The large vessel traffic density in this zone is up to 13 times greater than densities in most of northern Howe Sound. Ports and landing facilities are an important component of maritime and large vessel operations. Land facilities in Howe Sound include ferry terminals at Horseshoe Bay, Snug Cove on Bowen Island and at Langdale on the Sunshine Coast, ports at Squamish Terminals, Port Mellon Pulp and Paper Mill and Mamquam Blind Channel, and log handling facilities at Watts Point, which is located across the fjord from Woodfibre. The facilities at the Port Mellon Pulp and Paper Mill, Squamish’s Mamquam Blind Channel (MBC), and Watts Point move largely wood products, while the deep-water break-bulk facility at Squamish Terminals handles pulp, lumber, steel and other cargo. 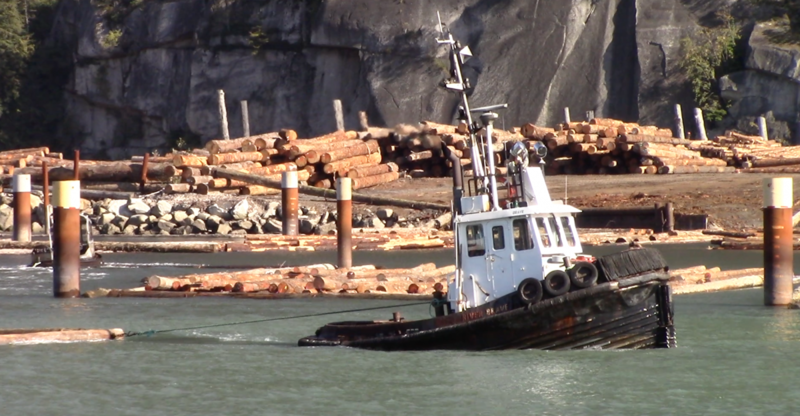 Goods shipped to and from Squamish through the MBC port also include hydro equipment, construction materials and logging equipment. Vessel calls to each facility are tracked individually by facility and anticipated change is hard to estimate with any certainty. 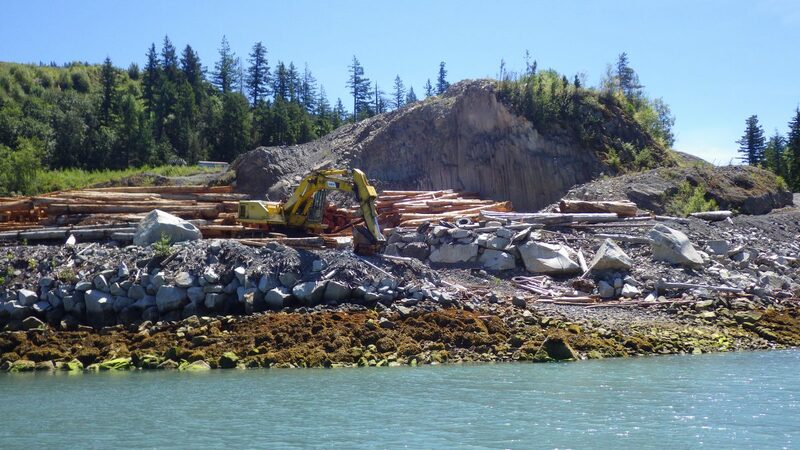 The forestry industry makes extensive use of the Mamquam Channel for log handling and inbound timber volume is projected to increase in the future. Two industrial developments would require new facilities and would result in additional large vessel traffic. The Woodfibre LNG project proposes six to eight large vessel transits per month through Howe Sound along with associated support tugs (approximately 40 LNG carriers per year, two transits per carrier) while the Burnco Aggregate project could contribute up to 34 transits per month (320 movements per year) of tugs and barges, based on projected volumes of gravel to be removed. It is uncertain if the vessel routes used by these two projects would necessarily overlap, but if both used Queen Charlotte Channel between Horseshoe Bay and Bowen Island, large vessel transits in this area could increase by nearly 50 percent. Several projects in the conceptual design stage, prior to submission of a formal proposal, may also increase large vessel traffic in Howe Sound. 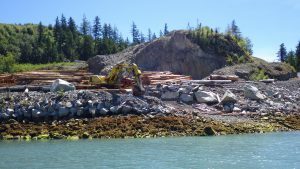 These include the possibility of solid waste export by barge from the Squamish-Lillooet Regional District, export of chips by barge from MBC, export of aggregate by barge from Watts Point, and a ferry from the Squamish Oceanfront Development. These activities may or may not come to fruition. Reduce your consumption of goods to reduce your footprint and the need for shipping. Educate yourself on the pattern, trend and function of large vessel traffic in Howe Sound, and any potential threats. If on a large vessel or transiting near large vessels, ensure you are familiar with best practices for transiting by wildlife, response to pollution, and emergency response. If you operate a large vessel terminal, keep the area clean and free from oil and other pollutants that can contaminate the nearby marine environment. Continue to support and grow the Marine Mammal Response Network to offer guidance on what to do in the event that a cetacean is struck by a vessel, or observed in distress. Create an alert system to notify large vessel operators via AIS when cetaceans are observed in the area (e.g., using real-time verified reports from the B.C. Cetacean Sightings Network, or a similar data source). Empower local communities by ensuring they are educated on the proper action in the event of an oil spill. Provide the required resources for these communities to safely respond and assist in the event of a spill. Ensure proposed developments have a thorough public consultation period, and ensure Citizen Science data and citizen scientists are consulted extensively for all development decisions. 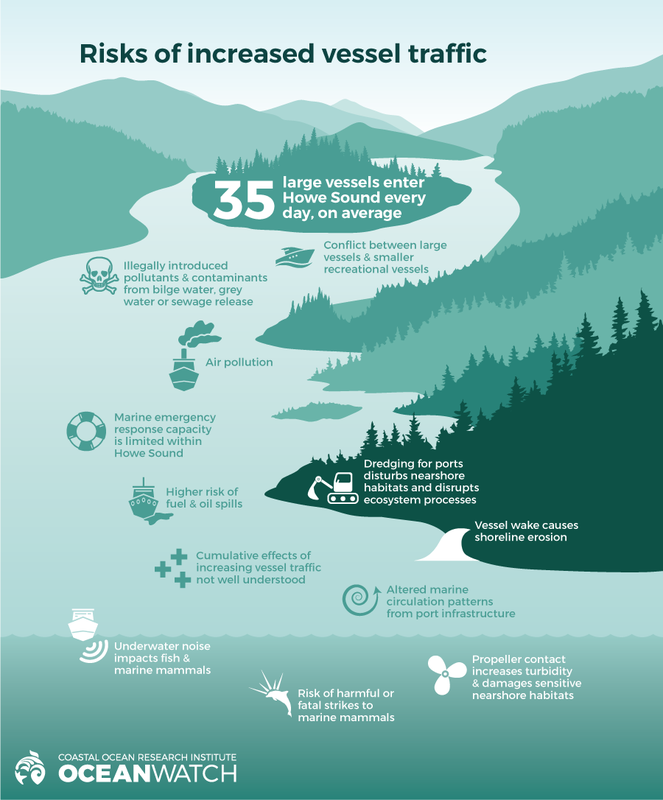 Increase monitoring of marine pollution produced from large vessels, and enforce penalties for preventable pollution. Monitor and enforce safe condition of vessels transiting the coast in addition to vessels coming from elsewhere. Create and enforce a mandatory safe-distance for vessels from marine mammals. Explore the possibility of implementing a Traffic Separation Scheme in Howe Sound. Incentivize slower transits within Howe Sound and the Vancouver area to aid environmental protection (by decreasing emissions, whale ship strike risk, and noise pollution). Explore the need for a policy related to shipping activities in the vicinity of sensitive marine habitats (e.g., productive estuaries).